^ a b c d e Cohen, Robert (2013). 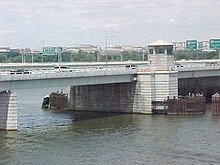 "History of the Long Railroad Bridge Crossing Across the Potomac River". DC Chapter, National Railway Historical Society. Archived from the original on February 3, 2014. Retrieved July 29, 2014. ^ "Welcome to the Long Bridge Study Phase II". Long Bridge Study. Washington, D.C.: District Department of Transportation, Government of the District of Columbia. Archived from the original on January 3, 2016. Retrieved January 30, 2016. ^ "Public Involvement". Long Bridge Study. Washington, D.C.: District Department of Transportation, Government of the District of Columbia. Archived from the original on January 31, 2016. Retrieved January 30, 2016.